Palam is starting to collect digital pictures* and short descriptions of ancestral churches of our members. Please send your submission with your national membership number to our EMAIL CLICK HERE * Picture(s) must be included with your information. Name is required, link to contact information optional. Manheim is very nearly the central point of New York state and is five miles east of Little Falls. It has been an immemorial tradition in the community that the town was called by Dr. Wm. Petry out of his personal associations in a town of the same name in Baden, Germany. Manheim was set off as a town from Palatine on March 3, 1797, and on April 7, 1817, it was annexed to Herkimer county. Originally Sir Wm. Johnson owned all the land hereabout, the same having been granted to him a few years before his death by King George, some forty thousand acres in all, called the Royal Grant. The oldest patent of land in the town was given to Rev. Petrus Van Driesen who for a quarter century was in the old First Dutch church of Albany. This grant was made in 1737 and contained twenty-five hundred acres. With him was joined Rev. John Jacob Ehle, and both of these men conducted a mission among the Indians, Ehle keeping at the work at what is now called Fort Ehle (still standing), for upwards of half a century, or until his death, about 1780. Originally the town of Manheim was in what was known as the Stone Arabia district, created in 1772, but in the following year the same was changed to Palatine district. In March, 1778, the Indians and Tories invaded the settlement and caused general devastation, some scalps were taken besides quite a number of prisoners. Among the families who suffered were those of Cobus Mabee, Conrad, Joseph, Abram and Jacob Klock, Mabus Forbush, Robhold Ough, Adam and Rudolph Furrie, Henry Shafer, John and Michael Keyser, Calvin Barnes. Between 1786 and 1796 the supervisors of the town were: John Frey, Christian Nellis, Jacob Eaker, Frederick Getman, Samuel Gray, and Jacob Snell. Judging from the votes cast for Governor, in 1786 tbere were a thousand population in the town then, while in 1796 there were over six hundred electors, indicating a population of thirty-five hundred. With the settlement of the town of Manheim in 1770 the people who were mostly German, soon formed the first church organization, and as they had to depend on the Stone Arabia Dutch Reformed church for preaching, naturally the organization followed that denomination. Most of the inhabitants were conservative and uneducated. They did not keep up either their German language or adopt the English, but used what was called a Mohawk Dutch. But with the coming of the New England settlers, who were better educated and more enterprising, and with the English preaching and English teaching in the schools, the community assumed a higher condition in morals and education. Sometime before the Revolution there were four of the Snell brothers, Jacob, Joseph, Peter,and Suffrenus, who gave seven acres of land for the church and twelve acres for the school. So many Snells lived in the vicinity that the place was popularly known, and is in a measure to this day, as “Snell’s Bush.” The first church built was burned sometime during the Revolution. The second church, probably erected soon after the war, served the congregation until 1850, when it was taken down, part of its timber used in the construction of the new edifice. On January 8, 1850, at a meeting of the congregation it was voted to build a new “St. Paul’s Reformed Protestant Dutch church” to be sixty by forty feet, and the following committee was appointed to build it: John Markel, Peter P. Snell, and Jacob Yoran. The consistory at this time consisted of elders, Peter A. Timmerman and Jacob Yoran; deacons, John Garlock and Levi Timerman. The “slips” (pews) were sold on February 3, 1851, for $4,464, and among the purchasers were eighteen Snells and ten Timermans. Peter P. Snell’s family was so large that he bought two pews for $221, while Adam A.Feeter paid $141 for a single pew, and Jehoram Snell $136 for a pew. All but half an acre of the nineteen acres given by the Snells was finally deeded to the church, an act of the legislature being necessary to consummate the deal and establish the title. In 1801 the Rev. Caleb Alexander who was travelling through the country wrote, “between Fairfield and Little Falls is a Dutch settlement called Manheim-rich farms, a meeting house and a minister. 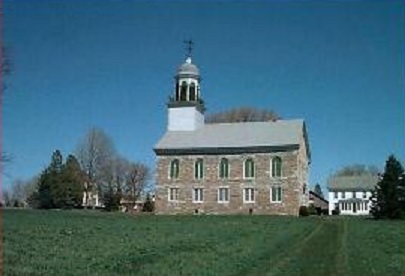 The church was at first called the Reformed Calvanist church, and was incorporated in 1792. Originally it was a German Reforrmed church, and is called “St. Paul’s” in the incorporation article. It united with the Montgomery Classis September 27, 1822. The church cemetery has recently been cleared and beautified and may be seen for many miles, on the high land surrounding the church. The principal burials are the Snells, Timmermans, Yourans, Feeters, Garlocks and Markells. The oldest stone in the yard marks the burial spot of Peter Snell who was born in 1731 and died in 1804. Other burial spots not far distant, as the one on the Beardsley farm where many of the Kilts family are interred, and another surrounding the Lutheran (“Yellow”) church, where many of the original settlers were buried, as the Keysers, Windeckers, Bellingers, Petries et al. were laid to rest, are interesting spots for the student of the early history of the town of Manheim and the valley of the Mohawk. 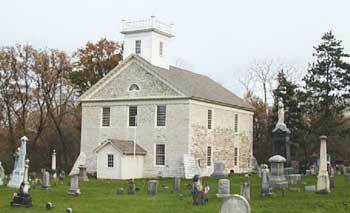 Fort Herkimer Church formed the central defense of Fort Herkimer throughout the Revolutionary War. During the war, a swivel gun was mounted atop the church tower and a wall of logs surrounded the church. After being wounded at the Battle of Oriskany, General Herkimer was brought to the church by boat from Old Fort Schuyler. He stayed overnight on August 6, 1777 and was moved to his home the next day. A year after the battle of Oriskany, Joseph Brant and a large party of Tories led a raid south of Fort Herkimer into the area that was called the German Flatts. A party of four American scouts came in contact with the raiders. Three were killed, but one scout, John Adam Helmer, was able to escape and warn the settlers in the area. All found shelter at Fort Dayton and Herkimer. There was no loss of life, but much loss of property. Here was born Nicholas Herkimer, eldest son of Johan Jost Herkimer. He became a general in the Revolutionary War and the hero of Oriskany. The town and county of Herkimer were named in his honor. After 1781, Fort Stanwix was no longer garrisoned and Forts Dayton and Herkimer became the most western strongholds in the Mohawk Valley. In July 1782, another war party of almost 600 Tories and Indians raided the area south of the fort. Most of the settlers were able to find shelter and the raid was driven off from the fort. In February 1783, in the dead of winter, Colonel Marinus Willett led the ill-fated attempt on Fort Ontario in Oswego from Fort Herkimer. The weather led to the failure of the expedition and the party of about 500 returned to the fort. Later that year, in July, Col. Willett greeted General George Washington at Fort Herkimer during a tour of the Mohawk Valley. Washington ordered that Fort Herkimer be set-up as a supply depot for the western forts, including Fort Detroit and Fort Niagara. These forts would eventually fall into American hands after the peace treaty with the British. The land upon which the original Stone Arabia Church was built (a long structure) and which stood where the present Lutheran church is now erected, was purchased from William Coppernoll of Schenectady, the contract being dated January 7, 1729, the deed to be given by April 9, 1731. The deed, however was dated May 19, 1732. It consisted of 50 acres for which 100 pounds was to be paid, the other parties to the transaction being Andrew Find, Warner Diegert, Johannes Schnell and “all the rest of the proprietors and owners of the Stone Raby patent.” In the following year (1733) the people, Germans Lutherans and German Calvinists, began to build a frame church, on the site of the building now occupied by the church. The foundation had been laid when a controversy arose as to the name by which the church should be known in the future. The Lutherans withdrew from the project and returned to the old log church, while the Reformed people continued to build. Johnannes Schnell and Johannes Krembs were the contractors, having given bonds for 400 pounds to finish the building according to the plans. Five years were spent in building, but no record is given of the cost or size of the edifice, nor any view exits of the church, unless, perchance, the ancient seal illustrates this first church. Rev. Wm. C. Berkenmeyer, pastor at the Palatine Stone Church (1733-1734), Lutheran, writes under date of August 11, 1734, that he had visited Stone Arabia and held services in a church jointly built by the Reformed and Lutherans. This must have been the original church. Under date of February 17, 1745, Rev. Peter Nicolas Sommer in his Journal writes that he had held a service of communion for the Lutherans of Stone Arabia in the barn of Wilhelm Nellis. This shows that the old log structure had already been abandoned, but as yet no Lutheran church had been erected to take its place. 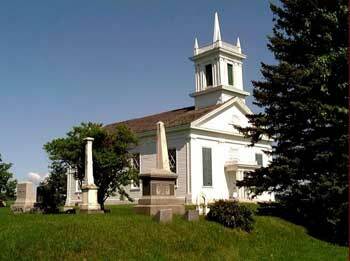 This old stone church, and the one at German Flatts (Fort Herkimer) whose foundations were laid almost half a century before it, are among the most remarkable and rarest ecclesiastical buildings to be found in the United States. The elements of time and innovation have not changed their forms, except slight improvement made necessary within. The same simple but substantial lines of craftsmanship that the builders wrought into these stone Houses of God abide to this day. Records of the Reformed Dutch Church of Stone Arabia, in Palatine, Montgomery Co, NY start 1739 for some records online at Ancestry. Check card catalog. St. Servatius Evangelical Lutheran Church in Duderstadt, Niedersachen, Germany is the ancestral church of the Kuehle and Kaufholz families. The Gothic designed church is built of sandstone blocks from the Sonnenstein quarry. It has 6 yokes and 3 naves. The oldest part of the present church is dated around 1370. In the 2nd half of the 15th century additions were made to the nave. The tower dates from the first half of the 16th Century. 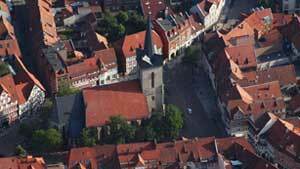 The Kaufholz and Kuehle families lived in Duderstadt from 1700-1850’s. Other families living in Duderstadt related to Tom Swinehart include: Stockfisch, Bredenback, Stromeiger, Goedecke, Gerlach, Koch, Engelke, Recken, Helmecke, Finke, Rudolff, Lehne, Lesse, Grotkopf, Morick, Sothen/Van Sothen, Monckeroff, Boning, Boden and others.